Bakery ovens use steam as part of the baking process. Consequently, all internal oven surfaces are prone to damage by hard untreated water. Limescale build up attacks elements, oven chambers and sensors and can lead to expensive break-downs and unwanted kitchen down-time. Protect your bakery oven from the harmful effects of scale and other minerals with a range of water treatment options from WaterCare. Methods of water treatment for bakery ovens and steamers include reverse osmosis and ion exchange as well as activated carbon. Speak to one of our customer service representatives to find out the best solution for your needs. WaterCare have successfully developed an ion exchange solution for bakery ovens by working with oven manufacturers. The result is the Vapour series which offers specialist cost-effective protection for steam ovens. WaterCare have also developed the Combi Pump which manages steam ovens waste water at low levels. A compact high-capacity reverse osmosis unit for use in a professional kitchen. It produces clean and safe water for bakery ovens and other equipment. Output 75-80 litres per hour. Protect your bakery oven from the harmful effects of scale and other elements. 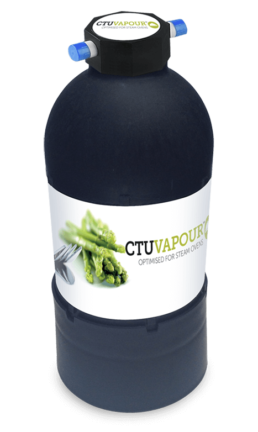 The Vapour CTU has been specially developed to work in harmony with bakery steam ovens for outstanding results. Available in 5, 10, 18, 23 & 30 litre capacities. 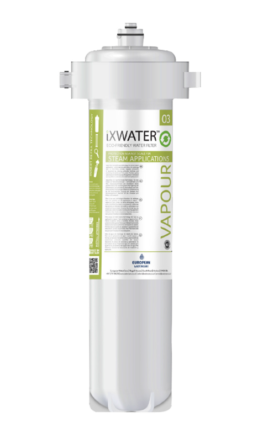 The iX Vapour 03 has been specially designed for use with bakery ovens and other catering equipment that uses steam. Its Insert Refill Technology provides a sustainable and cost effective alternative to mainstream cartridge filters already in the marketplace.